“For those who like to go fast, the Izoard Pro is just the right bike”, RoadBIKE magazine concludes the test report in its 4.2019 edition about the carbon road bike with Ultegra drivetrain and Fulcrum Racing 600 wheels. In a seven-strong test field of road bikes with rim brakes up to 2,000 Euros it was the one with the best overall package. The Izoard Pro has just the right qualities for fast ascends like the namesake Alpine pass Col d’Izoard in the French Alps with 2,360 meters (7743 feet) of elevation which was featured multiple times in the course of the Tour de France – “climbing definitely is one of the favourite challenges for the Izoard Pro”. This is predominantly due to the lowest weight in the test field at 7.8 kg (17.2 pounds) in frame size 56 cm: “None of the tested bikes is lighter. You can immediately feel it when accelerating and climbing.” The low weight of the wheels, their high stiffness and the stiff frame are an invitation to climb and sprint. The gears chosen for the full Ultegra groupset with semi-compact 52/36 cranks and a cassette including a 32-teeth cog offer a wide range of use – and add to the bike’s sporty character. Just like the seating position: “The rider sits more compact, yet with a bigger saddle-bar drop for optimized aerodynamics. This makes the Izoard Pro popular among competitive riders. In the test categories frame weight, total weight, wheels, specs, acceleration and climbing the Izoard Pro gets the best or some of the best grades –summed up this is good for the test win. Conclusion: The Izoard Pro scores with competitive riders looking for a light-weight road bike. A convincing performance – test win! The biggest story in the lead-up to the World Cup Waterloo weekend was the ongoing drama between three-time world champion Wout Van Aert and his (now former) team Sniper Cycling. After a successful road campaign in the spring which included a podium at the Strade Bianche, Van Aert signed a contract with Lotto NL Jumbo starting in 2020. As Sniper’s planned merger with Aqua Blue Sport fell apart and the latter folded, Van Aert became alienated from his team. Two Sundays ago, Van Aert raced at Brico Cross Geraardsbergen in what was his last race with Sniper’s cyclocross program Crelan-Charles. Monday, he broke his contract with Sniper and headed to the U.S. as an unattached rider. Van Aert was without a contract and team and more importantly—at least for racing in Waterloo—a bike, equipment and support staff. 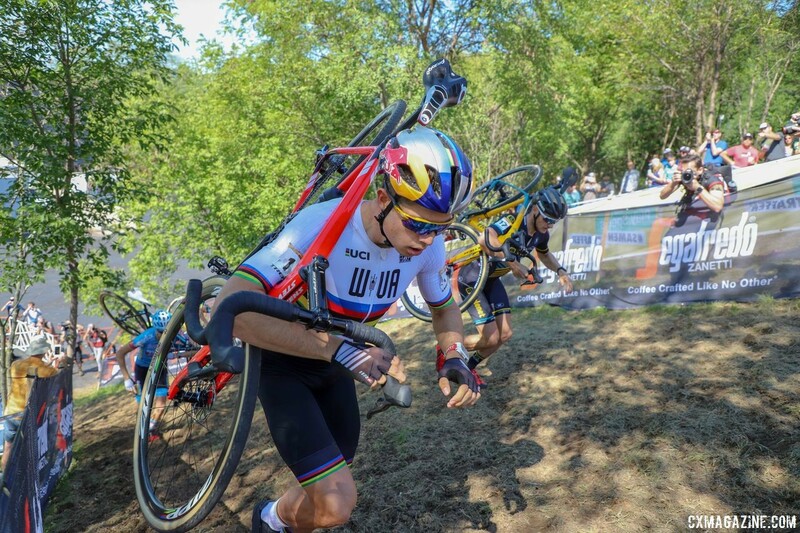 Unable to cancel his plane ticket, Van Aert pulled off an impressive feat of cobbling equipment together to race Sunday’s World Cup Waterloo. He wrote about it in a rider diary for Wielerflits, which details his whirlwind. 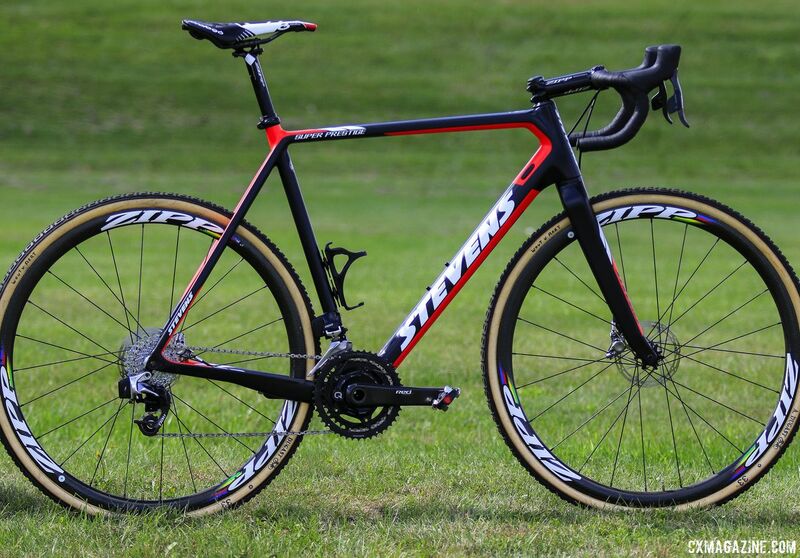 First, Van Aert reached out to his (now former) bike sponsor, Stevens. Although he had several offers from other manufacturers, he was pleased with his experience on the road and wanted a continued relationship with the brand. The German company was happy to outfit another World Champion and sent the last two framesets in his size it had to the United States via Jef van den Bosch, Van Aert’s now ousted manager at Sniper. 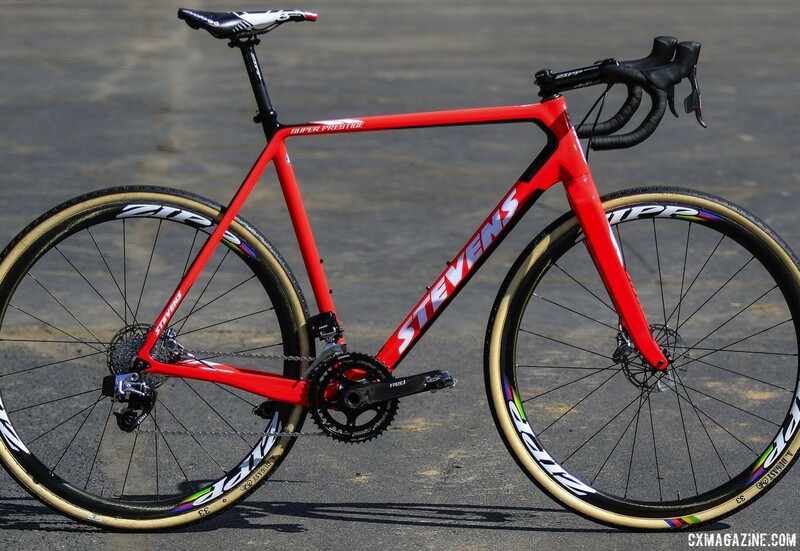 With Van Aert, Stevens now has both Elite World Champs, since Sanne Cant also rides a Stevens. He also reached out to Codagex—a Belgian online retailer of bicycle components and accessories with whom Van Aert had a good relationship—who supplied Prologo saddles. Both were brought by Van Aert’s soigneur Wesley Theunis, who was flying to the U.S. Meanwhile, Van Aert had reached out to his contacts at SRAM, who provided him with a Red eTap groupset and Zipp wheels and cockpit components. 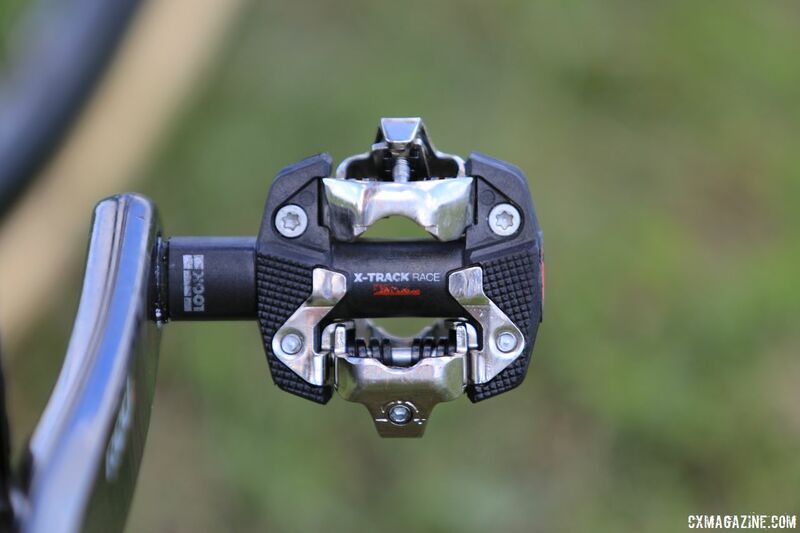 As luck would have it, Van Aert had already arranged for his bikes to be transported months earlier by domestic racers, who were able to provide him with Look X-Track pedals, Look’s latest Shimano-compatible clipless pedal. Finally, Trek subsidiary Bontrager, who was already supplying Van Aert with shoes, worked with Red Bull to supply a sponsor correct helmet to the World Champion. So what was the final result? While he finished second to Toon Aerts (Telenet Fidea), Van Aert showed the skill of a top-shelf team manager in putting together a program last minute halfway around the world. Van Aert managed to retain almost identical bikes after splitting with his team and was able to employ local mechanics to survive the weekend. The last time we checked in with Van Aert, he was riding a Felt FRDx equipped with SRAM components and Zipp wheels. Van Aert won his third-straight world championship in Valkenburg on the frame, but during the season there were rumblings Van Aert and his team were unhappy with the Felt bikes. Stevens lost Mathieu van der Poel as a rider in January when Corendon-Circus switched to the Canyon Inflite, but the company is back in the game with both world champions now riding its flagship Super Prestige. 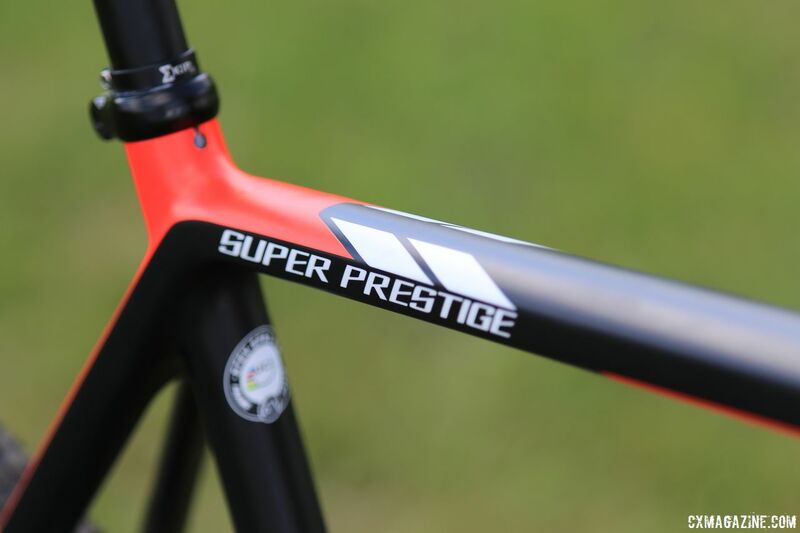 The bike has a pro pedigree and was designed with input from sponsored pros to meet the needs of top-level riders. 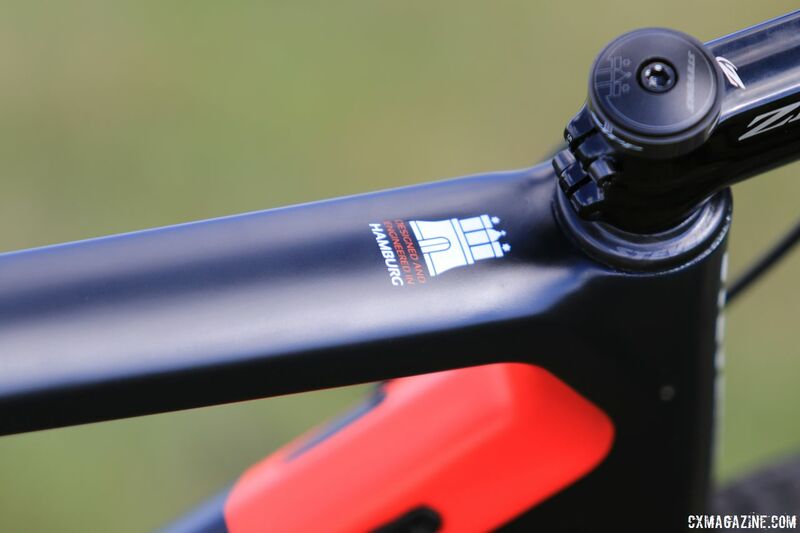 It features a claimed 1,000g frame and weighs less than 1,400g as a frameset, and is up to date with flat mount disc brakes, 12mm thru-axles and a tapered head tube. Van Aert had two frames with him in Waterloo. One was black with red accents and the other was red with some black. 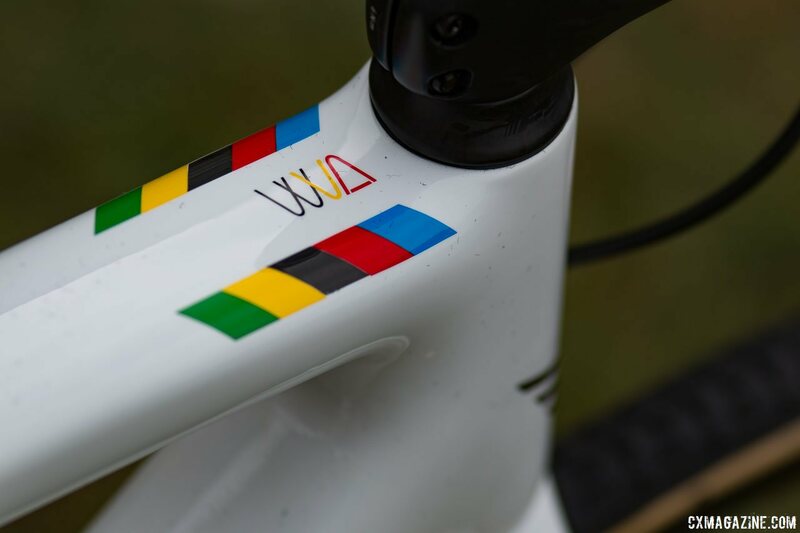 Given it was a minor miracle Van Aert had the bikes at all, they lacked the rainbow flair we have grown accustomed to seeing on world champions’ bikes. With SRAM backing him, the World Champion rode a Red eTap wireless hydraulic groupset. 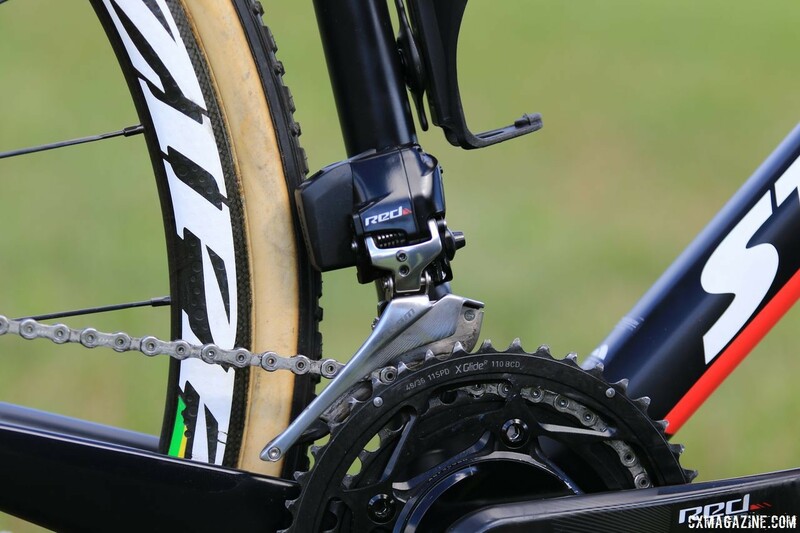 He continued to use a Quarq DZero power meter and 46/36t chain rings. Van Aert rolled on Zipp 202 tubulars with Dugast tires. He picked two different treads, one for practice, another for race day. 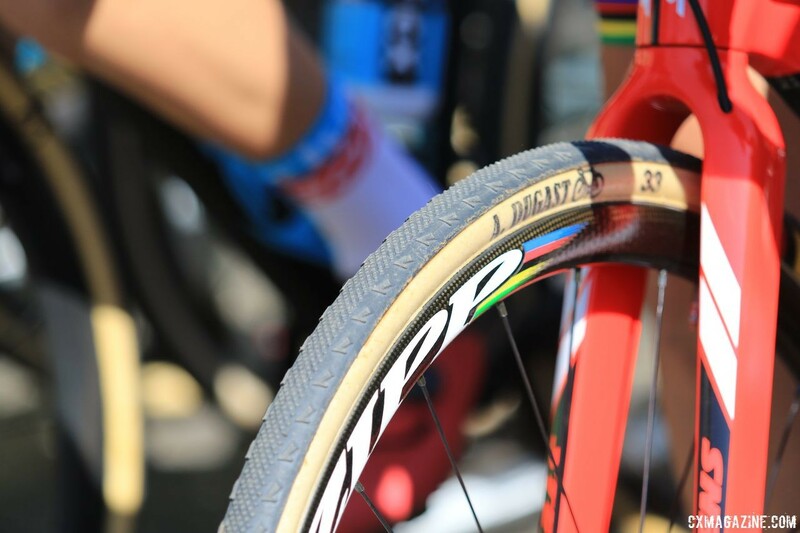 While Dugast tires have won the majority of Worlds titles, they have been hard to find after CyclocrossWorld stopped stocking them. Jonathan Page has given the long-coveted tubular tires a presence in the U.S. The tubular wheels, at least, had some colors worthy of the champ. Conditions at Trek headquarters changed a bit during the weekend. Pre-race rain left the course soft and a bit muddy on Friday, but by the time Sunday rolled around, most of the ground was dry, if not at least softer than it was in 2017. During Saturday’s pre-ride, Van Aert had an intermediate Typhoon mounted up, but on Sunday he opted for a Pipisquallo file tread. 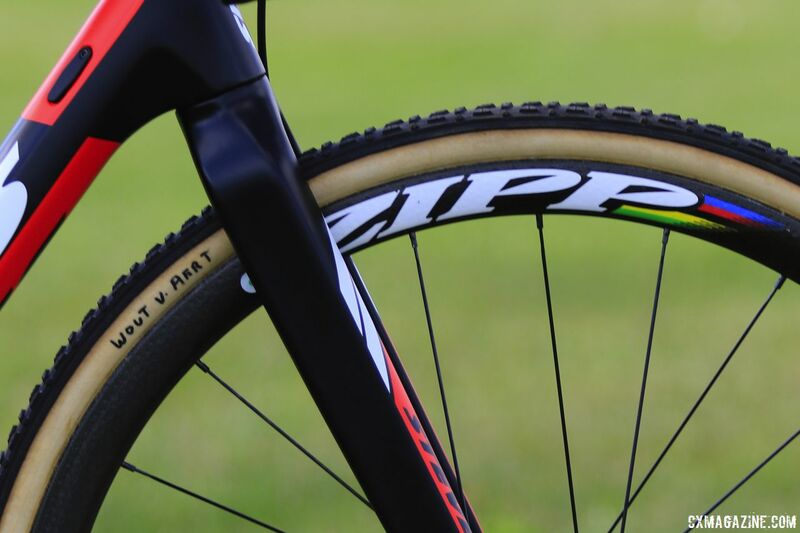 Van Aert rolled around Waterloo on Zipp 202 Firecrest tubular wheels. 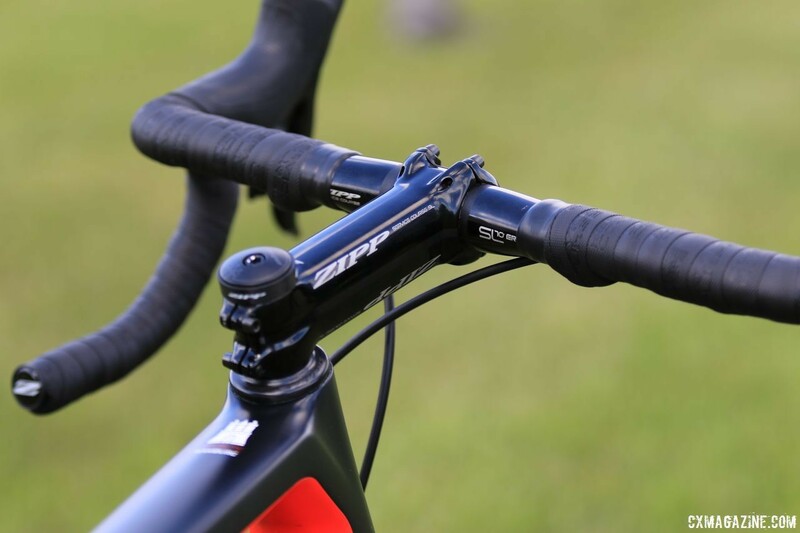 Zipp also provided Van Aert’s cockpit, and he raced a Service Course SL handlebar, seatpost and stem. Van Aert’s saddle was a Prologo, which is the same as last year. Last year, we saw him use Time pedals, but this year, he had Look X-Track pedals. Coincidentally, the trailer of the two mechanics helping him out in the U.S. was also sponsored by Look. Interestingly, Van Aert used a Bontrager Bat Cage and a Trek Quick-Connect water bottle mount for his hydration needs to round out his Bontrager helmet and shoes. On Saturday during a short interview at the SRAM tent, Van Aert said he has his team back in Europe looking for sponsors to allow him to race cyclocross this season. We are guessing the search will be successful, but it remains to be seen what bike he will be riding once back in Europe.